If you are taking your first steps into dancing , then you will find our Dance Class DVD to be a fabulous easy to follow guide to the main Ballroom and Latin Dances. All the dances are explained in a simple easy format with demonstrations on how to dance the steps. DVD and FREE music CD Now reduced from £29.95 to only £19.95. You can learn to dance in the comfort of your own home and we will teach you Dance all those dances that are the most popular. From Waltz to Quickstep, Tango and Foxtrot, Cha Cha and Rumba , plus Rock and Roll, Salsa and Merengue. There are 9 dances on this easy to follow guide to learning how to dance. If paying by card – please continue to follow the Paypal instructions and you will be taken to a page to fill in your card details. You dont need your own Paypal account to be able to make a purchase. 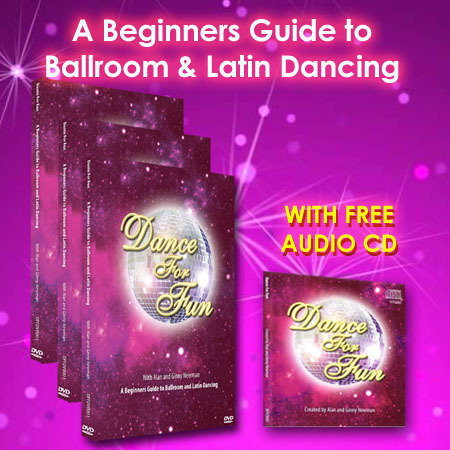 Beginners Guide to Ballroom and Latin Dancing DVD. Learn to Dance using Our Beginners Guide for Ballroom and Latin Dancing. 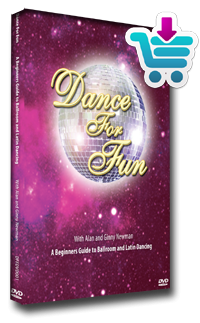 It contains 9 basic routines for beginners with descriptions and easy to follow instructions on the main Ballroom and Latin dances. Quickstep- It does exactly what it says on the tin. Quick and fun. Tango – Dramatic yet with our guidance, The Tango is fun and easy to learn . The music is alive with drama. Rock & Roll. – Another fun, yet energetic dance. Great for parties and letting your hair down. The instructions on the DVD are simple and easy to understand and follow, with Ginny and Alan taking you through the steps so that you can see how they should be danced. You can keep rewinding to watch again and again how to dance the steps. In some ways this is better than an actual Dance Class as you can’t rewind at a dance Class. Now with a FREE AUDIO CD, contains all the music from the DVD so you can listen and practice to the correct music.